See a video of this low profile 3-wheeled Toyota Fork Truck has cushion tires and three wheels for excellent maneuverability that allows it to turn on a dime. It has a 3-stage mast and side shift attachment. For more information and to see more, check out our Used 3-Wheel Forklifts Page. Watch a video demo of a Bendi B30 fork truck in action. Bendi swing reach forklifts are great for maneuvering around in warehouses with narrow aisles. The forks swivel, allowing the driver to retrieve product even the tightest areas. For more information and to see more, check out our Used Swing Reach Forklifts Page. As part of the recent warehouse acquisition in South Carolina, SJF purchased over 25 great forklift trucks! These trucks are all in excellent condition, have relatively low hours and can be used for a variety of warehouse tasks. 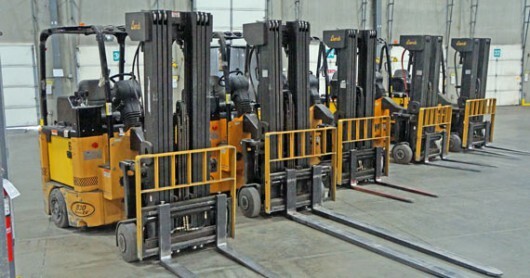 Below, find a summary of each lift truck type currently available, and links to them on the SJF.com website. The life of the tire on a forklift is a difficult one. A forklift does not have suspension, so the tires alone are responsible for softening the ride for the cargo and the employee driving the vehicle. 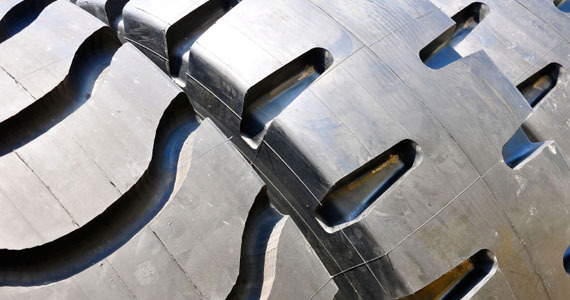 Forklift tires will have to traverse over some truly rough terrain at your factory or worksite and on average they will carry more than 9600 pounds at one time. In addition to all of the stopping, turning, reversing and accelerating that the forklift will do, the tires take quite a beating. This is why it is important to keep a close eye on the tires of your forklift and to replace them when needed. Driving with damaged tires can cause a lot of issues, because the wear on the tires will not be even and will cause the vehicle to become unstable. Also, when the tires are low this means that you run the risk of hitting a dock plate or running into debris on the floor. Furthermore, the damaged tires will contribute to the greater vibration of the forklift, which results in increased driver fatigue and also wears out the forklift faster. The worn out tires will also be more likely to shake and jolt on harder surfaces, which can make the driver lose control or cause the load to become unstable. If you are concerned about the status of your tires, you can always consult the services of a forklift specialist to take a look at them. They will be able to give you advice on whether or not the tires of your forklift fleet need replacing. If the tires are worn or damaged in any way, they will likely recommend replacement so that the vehicle will not only function better, but also be much safer for you and your employees to drive while you are on the job. Aki Hashimoto is a writer who believes that businesses who use heavy machinery and vehicles such as forklift trucks should consider the safety of their staff constantly. By monitoring and replacing forklift tyres when necessary, you will help to improve the safety of your business environment.